Image by Betchaboy via Flickr - Jeff Utecht, Julie Lindsay and Darren Kuropatwa.What Julie is not. Not leading a massive consortium or state organization. Not a VP in a big company. A regular IT director and classroom teacher who has maxed out credit cards to keep international projects going so that schools from all walks of life could participate and collaborate. Someone who has pushed me to my limits - helped me be better and more. Julie works with intensity and drive. Julie lives with an intensity that can be intimidating - even for me. But when she does something, she does it well. She takes very seriously her legacy to help others and to connect schools and schoolchildren. I first met Julie in 2006 as part of the K12 online conference and this relationship has gone on to be one of the defining relationships of my life. So, yes, I'm biased. Hugely biased. I support and appreciate ISTE. But ISTE needs someone like Julie on the board. She has some great ideas and a lot of energy and vitatlity to bring to the table. As a leader in the International Baccalaureate program, online instructor, and face to face instructor - Julie really represents all of us: IT Directors, Teachers, Administrators, Professors, Professional Developers - she's really doing it all. She's even run a project based learning conference - TWICE! She gets it. 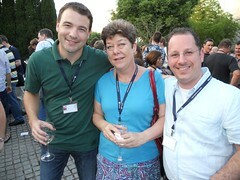 ISTE is already a very good organization but it could be more International. Sometimes it is so vested in North America - specifically American politics- and that is a valid purpose - that it misses the International Reflection that it needs. Not a criticism as much as an observation. Julie Gets and Uses Social Media. But the thing that distinguishes her is that she understands and uses social media and openness. She has a passion along with me to stop talking ABOUT students and start talking WITH students about how to improve education. She uses Twitter, blogs, social media, and all types of tools. Julie is part of the connection with so many people. She knows a lot of people in the edublogosphere and around the world who are doing amazing things in Edtech. In many ways, she is a hub - but not a hub of information - a hub of "Perspiration." She's the center of a lot of WORK that goes on - from the Global Education Conference (GEC) to the Flat Classroom Projects and Conference - she brings a lot to the table and leaves it all on the table. If you feel like blogging or asking others, I'd appreciate it. So many amazingly qualified people. I know that all of them are very well qualified, want the position and would do a lovely job. So again, this isn't AGAINST anyone -- it is just that Julie has put herself out there THREE times and has run THREE TIMES for this. It is time. If she doesn't get elected this time, she may not let herself run again. She's running because her friends have asked her to. We think she has the credentials and the ability to stand up for the international educator, the classroom teacher, the IT director, and the openness that social media needs to have. Yes, she's grassroots but that is what we need. As her friend and someone who works with Julie a lot - I'd hate to see the amount of time that ISTE would take her away from me and our projects but I think that it would improve edtech as a whole. So, my friends. I'm asking you #voteforjulie - please, spread the word!